MANUFACTURER'S PRODUCT INFO: Unlike most meters that need to be manually coded to assure accurate results, BREEZE2 continues the innovation of previous Bayer meters by automatically setting the correct code any time a Bayer test strip is inserted - so there is less chance for error and fewer steps. With the new BREEZE2 blood glucose meter, people with diabetes can now obtain accurate blood glucose test results in just five seconds. The new meter also offers improved test memory to support better diabetes management. 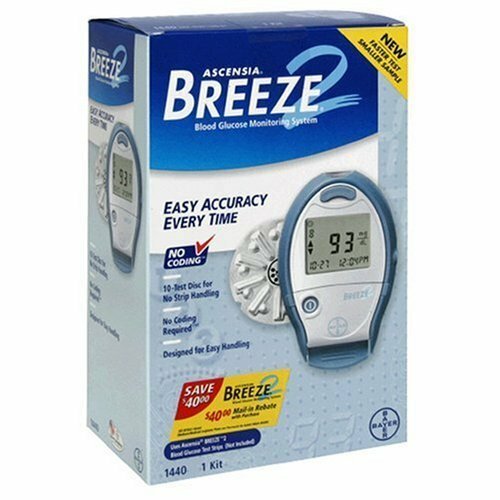 BREEZE2 requires a small blood sample (1) size and includes a 10-test disc system, allowing users to test 10 times without handling individual strips, and has received the Ease-of-Use Commendation from the Arthritis Foundation. If you have any questions about this product by Ascensia, contact us by completing and submitting the form below. If you are looking for a specif part number, please include it with your message.